T-Shirt quilts are a work of art. They are the scrapbook you can sleep under. You have a drawer full or a box of treasured tee shirts that you have been collecting over the years. Maybe they are school, sports or vacation shirts. You've heard about t-shirt quilts but don't have any idea about how to get one made. There are SO many t-shirt quilt/blanket makers out there. 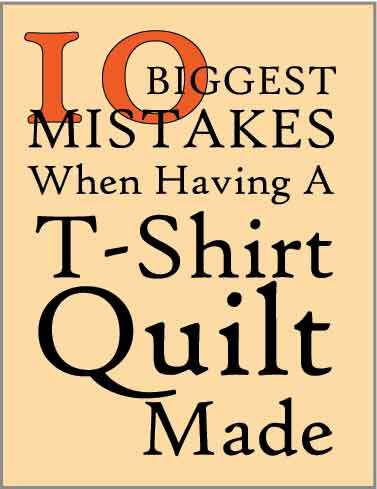 (More on difference between a quilt and a blanket) There are good t-shirt quilts and the not-so-good results. Here are 10 of the most common mistakes made by the non-professionals, and even some professionals. Be sure to ask your quilt-maker lots of questions and ask to view examples of their work. Workmanship - there are so many aspects to good workmanship. - Do the seams run straight? - Are there tucks in the seams? - Are there holes or missed stitches in the seams? Look closely at the photos, and you can tell if the quilt-maker takes care when creating your quilt. T Shirts cut out in random sizes - T-shirts come in all shapes and sizes. Are the logos of the shirt centered, or just whacked off? Sometimes you will see a bit of the collar in the block. That is fine, and I'll bet the image is centered in the block. Cheap Materials - Cheap quilts = Cheap materials. Just a fact. In order for a quiltmaker to offer cheap quilts, they have to skimp somewhere. Usually, this is in the materials used. Don't go for the solid colored fabrics, fleece, or other polyester fabrics. Ask if the quilt maker used 'quilt shop quality' fabrics. Cheap Batting - Thicker and fluffier is not better! The really thick (high loft) battings are usually made of 100% Polyester. This equates to being HOT to sleep under as polyester does not 'breathe'. You want a quality batting that is at least 80% cotton. Some polyester is OK, as it helps the batting hold together. All cotton battings will not hold up to multiple launderings. Seam intersections not matching - When four corners meet. it should be perfect. Many times when there is no stabilizer, the t-shirts are stretched and don't match up. Intersections should be flat and not forming 'volcanoes' (quilters technical term for those lumpy intersections). Read more about quilty technical terms. Poor design layout - Whether traditionally pieced or random/chaos pieced. If the layout is not pleasing, you won't be happy with the quilt. You won;t understand 'why' you don't like it, you just know that it does not 'look right'. A professional quilter will have experience and an eye for layout. This only comes with experience. More about Traditional quilts vs. Random Quilts. 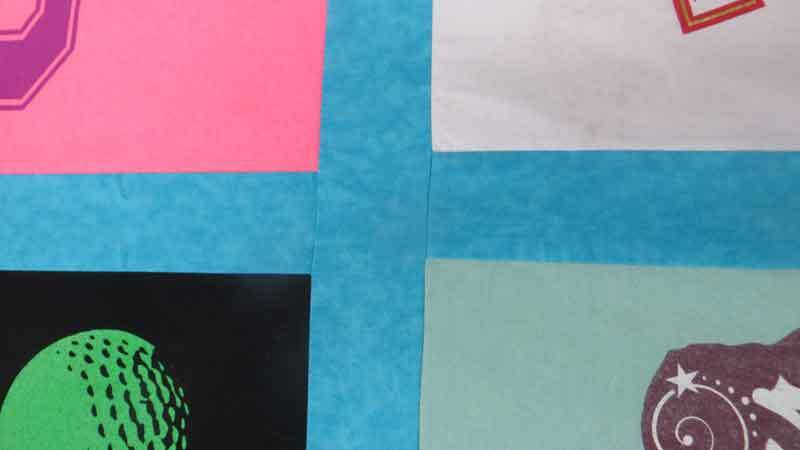 No sashing or Cornerstones - Sashings and cornerstones are an important part of creating a flat and even quilt. The sashing adds stability to the t-shirts, and the cornerstones, while adding a nice design element helps make sure the rows and columns all line up in a straight lines. Not Quilted - What is holding the layers of your quilt together? Tying? - not a good option as it is usually too far apart to hold the quilt layers together for the long haul. You want to be able to cuddle, drag around and launder this quilt for YEARS to come. Professional quilting adds a pleasing all-over design to the quilt that does not take away from the t-shirts, but adds that finishing touch that makes you know you have a quality quilt. Not finished properly - Binding is the term for that outer fabric coverin the raw edges of the quilt. This is just as important as the other elements of YOUR quality memory t-shirt quilt. Some quilts/blankets just roll the backing up and over the outer edge to cover the raw edges. The really cheap blankets just do what is called the 'pillowcase' method as they literally just sew around the outside edges and call it good. You can still have a quilt made with high quality materials, but if the maker is not skilled, you will still have a disappointing quilt. Please do your research, and find out how many quilts your potential quilt-maker has actually made. 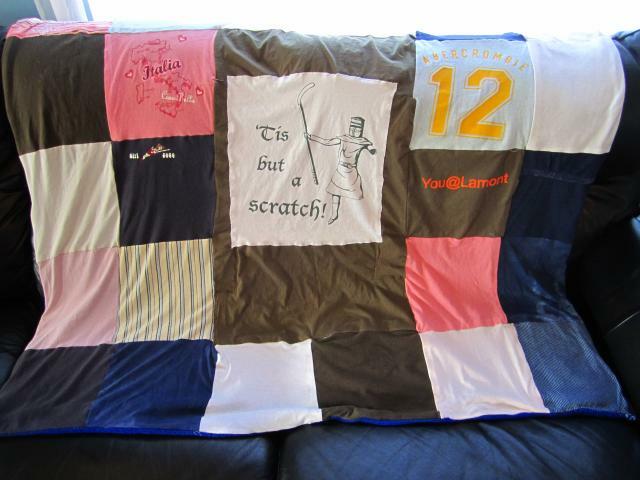 Make sure you the t-shirt quilt you get is one you will be proud of.